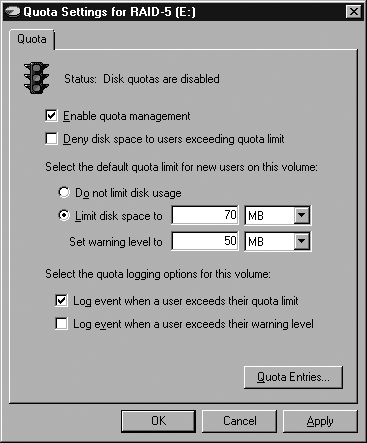 Windows Server 2008 supports two mutually exclusive methods for setting quotas on the amount of file system resources a user can use—disk quotas or directory quotas. 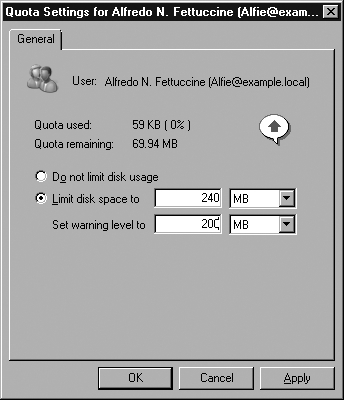 Disk quotas were introduced in Windows 2000, and are applied to specific users and limit the amount of disk space that user can use on a particular volume. Directory quotas are applied to all users and limit the amount of disk space that users can use in a particular folder and its subfolders. Directory quotas were introduced in Windows Server 2003 R2 with the new File Server Resource Manager, and they are covered in detail in Chapter 20. In Windows Explorer, right-click a drive letter and open the properties of that drive. Click the Quota tab, shown in Figure 19-23, and then click Show Quota Settings. Select the Enable Quota Management check box to enable quotas for the disk, as shown in Figure 19-24. 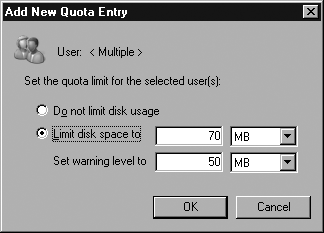 To enable hard quotas that can't be exceeded, select the Deny Disk Space To Users Exceeding Quota Limit check box. Set the limits and warning level, as shown in Figure 19-24. You can also enable logging on this page. Click OK to enable the quotas. You'll be prompted one last time to confirm, as shown in Figure 19-25. Click OK and the quotas will be enabled. You can set quota limits on individual users, or you can have limits apply equally to all non-administrative users. Unfortunately, you can't set limits on groups of users. And any users who already own files on the disk will have their quotas initially disabled. New users will have the default quotas for the disk applied as you would expect when they first save a file on the disk. Click the Quota tab, and then click Show Quota Settings to bring up the Quota Settings dialog box for that disk. Click Quota Entries to open the Quota Entries dialog box for the disk, as shown in Figure 19-26. To modify the quota for a user already listed, select the user and then click Properties to open the quota settings for that user, as shown in Figure 19-27. Set the quota for the user and click OK to return to the Quota Entries dialog box. To create a quota for a user who doesn't have one yet, and who needs a quota different from the default for the disk, click New Quota Entry. Select the user or users to apply the new quota to, and click OK to bring up the Add New Quota Entry dialog box, as shown in Figure 19-28. Click OK to add the new entry and return to the Quota Entries dialog box. Close the Quota Entries dialog box, click OK in the Quota Settings dialog box, and then click OK in the Properties dialog box for the drive. To manage quotas from the command line, you need to use Fsutil.exe. Even for a determined command-line type, it's pretty lame. Stick to the GUI, and use import and export whenever possible. Managing disk quotas is a potentially tedious job if you try to use fine-grained control of individual quotas. The best solution is to use a single, general quota that is correct for almost all users, and then do only limited exceptions to that quota for very specialized cases. If you do have complicated quotas, however, and you need to transfer them to another server or another volume, you can export a set of quotas and then import them to another volume. Open the Quota Settings page for the volume you want to export the quotas from. Click Quota Entries to open the Quota Entries dialog box. Highlight the quotas you want to export. Choose Export from the Quota menu. Type in a name and location for the export file and click Save. Open the Quota Settings page for the volume you want to import the quotas to. Choose Import from the Quota menu. Type in a name and location for the import file and click Open. If there are conflicting quotas, you'll be prompted to replace the existing quotas, as shown in Figure 19-29. Figure 19-29 Importing quotas can cause an existing quota to be replaced. Choose to replace a quota by clicking Yes or to not keep the existing one by clicking No. You can have the action repeated for any further conflicts by selecting the Do This For All Quota Entries check box. 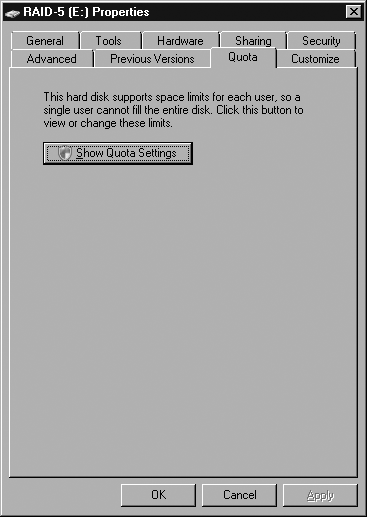 Disk quotas, which were originally introduced in Windows 2000, were a big step forward and gave the Windows system administrator a new and valuable tool to limit the spiraling growth of storage requirements on the server. But like many Microsoft version 1.0 implementations, it wasn't a perfect solution. It's difficult to manage quotas effectively without creating too many exceptions to easily keep track of. You can apply quotas only on a per-drive letter level, and they don't affect mounted volumes at all. And quotas are indiscriminant—they treat document files the same way they treat .MP3 files. Quotas also arrived too late to the scene. Just about the time disk quotas were introduced, the hard disk industry started a round of massive growth in hard drive size. At the same time, the price of even enterprise-class hard drives came down dramatically. Finally, with the introduction of the File Server Resource Manager, we now have folder-level quotas and file-type filtering. If you need quotas, we recommend that you use these.